Sucré – A Minor Bird: Solo act or Supergroup? Sucré is surprisingly sweet in either circumstance. In Brief: It might be tough sell for a lot of Eisley and/or MuteMath fans, but this one hits the sweet spot for me. It’s romantically dark, and darkly romantic. Supergroups are a unique and often untamed beast in the world of popular music. Often the idea is better on paper than the actual execution: Three or more artists, all with their own notable bands or solo projects, come together to collaborate on a project that often tends to mystify, if not downright frustrate, folks from each of their respective fandoms. A few have survived to become memorable acts in their own right, sometimes even surpassing the members’ “main” projects in popularity. But usually these sorts of things get relegated to the “seemed like a good idea at the time” bin. Often the problem is that there are too many cooks in the kitchen – too many people used to running their own show and now having to cooperate with folks who they may know well as personal friends or at least respect as fellow artist, but whose work ethics might be completely different and whose ideas might clash. I’d say this probably goes double if there are any married couples in the group. Imagine you and your spouse are in the same industry but work in completely different facilities, and then one day one of you switches jobs and now you spend all day working together. It takes a special chemistry to make that actually work, and it’s not automatic for a lot of couples, who would probably rather do their own thing their own way and then come home to tell each other about it at the end of the day. Given all of these concerns, I’m actually quite amazed that the members Sucré not only managed to get their little side project off the ground, but that they actually crafted a beautiful album in the process. When I first found out about this group’s existence, I’ll admit that I quite nearly wet myself. I was reading up on singer/songwriter Jeremy Larson as I prepared to review one of his albums, only to discover in his blog that he had been working on a then-unnamed project with Stacy Dupree-King, one of the three sisters who fronts Eisley, and her husband Darren King, who just so happens to be the drummer for MuteMath. Knowing that those two were married was mind-blowing enough (Stacy’s got a bun in the oven currently, and let me tell you, that kid’s a likely prodigy! ), but throw in Jeremy Larson’s gift for layering and lush arrangements into the mix, and that sounds like an irresistible recipe to my ears! I suppose the most obvious audience for this sort of thing would be Eisley fans, particularly those who love the group for their fantastical lyrics and sweet sisterly harmonies. The untrained ear likely can’t tell the difference between Stacy and her older sister Sherri Dupree-Bemis, since they trade leads quite often when they’re not singing simultaneously, but I’ve always pictured Stacy as the more sweet and innocent of the two, and Sherri as the more dark and brooding. Imagine the sweet side amplified and the more conventional rock elements downplayed, and that gives you an idea of what Sucré is going for. Meaning, if you’re like me and The Valley was a bit of a disappointment to you as an Eisley fan, then you’ll probably breathe a sigh of relief upon hearing this one. Fans of MuteMath who can’t get enough of Darren King’s energetic and just plain insane performances behind the drum kit will probably find that he’s the biggest fish out of water here. Where his influence comes to the forefront, it’s in more of an experimental fashion, adding a seductive little groove or even a bit of electronic dissonance to an otherwise tranquil, baroque pop sort of arrangement. Some tracks lack percussion entirely, so I can only assume he’s contributing in some other way (mostly likely lyrics, though it’s worth noting that every member of MuteMath knows how to play multiple instruments and Darren is no exception – so at times I can’t tell who’s playing what). Ultimately I think this is for the best, since while I love the crazy fast dance and funk rhythms he lays down for MuteMath, I can’t imagine Stacy or Jeremy thriving in such a context. Jeremy Larson’s most likely the contributor you know the least about here, since his solo work seems to have remained pretty far underground. If there’s any chance you’ve heard his work, it’s more than likely on Sleeping at Last‘s recent Yearbook series. In the likely event that you’re familiar with neither, I’ll just summarize and say that the man is practically a walking orchestra. He not only knows how to arrange a string section, but he can perform and layer every single aspect of it entirely on his own. This gives his arrangements an incredibly distinctive style that set them apart from the typical “let’s all get emotional now” sort of canned string arrangement you might hear on a typical pop or rock album. While his fragile vocals are quite capable of conveying the emotion needed to match such arrangements, putting Stacy at the mic just makes them sound that much more decadent. 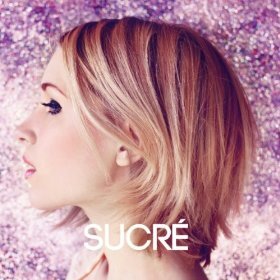 Ultimately, while it looks like it’s being marketed as a solo project by Stacy, every member seems to contribute equally to making Sucré’s debut album A Minor Bird the unique, beautiful creature that it is. It’s one of my favorite albums of 2012 thus far, and if you have any inclination toward the dreamier side of pop music, it could well become one of yours. There’s this serene wash of layered vocals right at the beginning of the album that will probably make a lot of unsuspecting listeners think, “Dude, when did I buy an Enya album?” There’s no mistaking it for anyone else once you hear Stacy’s voice all by itself (it’s more high-pitched and chirpy than Enya’s, though she’s a lot “breathier” than normal here), but it just goes to show the potential that can be achieved when you match this voice with the swelling strings and horns of a Jeremy Larson arrangement. This is one of his finest, backing off at the verses to focus more on the small sound of a classical guitar. But the slow swells when she hits the chorus are like gracious, crashing waves. This all sounds pretty enough to mask the startling effect of the lyrics (which, frustratingly, aren’t in the liner notes). Stacy’s begging someone who has shut her out emotionally to let her in, and on several occasions she points out, “My money is paid”. It raises some uncomfortable questions about the nature of the relationship – “You take it too hard when I don’t even feel it/’Cause you’re paying for my love.” This odd transaction of money for emotional intimacy culminates in a sad observation: “Nobody wants anything unless you give it to them like it’s worth something.” I suppose that sets the tone well enough, because this is gonna be one heck of a melancholy ride. This is the group’s first single – and I have no idea how much room there even is for fanciful, baroque pop on radio stations obsessed with who can make their voice sound the most robotic these days, but in any case, it’s one of the most straightforward and catchy tracks on the album. It’s compact enough to be a juicy little morsel you can use as a litmus test to tell you whether you’d be interested in hearing more, and with Darren’s strong, marching drum beat, Jeremy’s strings practically leaping for joy, and Stacy’s wistful vocals as she sings about a simpler time, it’s definitely a showcase for everyone in the group. The lyrics remind me of vintage Eisley, when the group wasn’t afraid to imagine themselves playing a myriad of characters, even if those characters were old and fragile and ready to die. Remember “Memories”? This is that sort of a song. Here an old woman reaches out to her husband, and perhaps his health is failing or perhaps they’ve been through enough heartache to feel like they’re both on the brink of death. And they remember the naive trust that they so easily pout in each other when they were just kids, and she asks if he’d be willing to open up and be just as vulnerable now as he could back then. There are millions of songs that wax poetic about the bliss of youth out there, but I feel like the ones that try to artfully express a hope of recapturing it without just getting lost in our glory days are rare. So while the song’s so short that the deeper layers in it are easy to miss, it’s one of those that works on any level that you want to engage it – it’s beautiful on the surface and still incredibly striking when you get to its core. “Lost at Sea” sure was a lovely little song when I first heard it seven years ago. But as far as gentle, gracious songs about drowning go, this one beats it. Stacy’s tranquil piano and Darren’s constructed rhythmic loop made up of peppy hand claps and deep, thumping bass both sound like elements scavenged from their respective dayjobs, but the clash of sounds here is what makes the song special. Add a string arrangement that swirls around like a flock of sirens going increasingly berserk, threatening to pull the listener into the sweet bliss of an underwater demise, and you’ve got enough of a musical tour de force that it’s hard to believe a four-minute pop ballad could do it justice. Stacy’s negotiating with some sort of a difficult lover who infuriates her with his “infinite dreams” and who seems to want to spare her sanity by leaving her. The whole song seems to teeter on that question of whether it’s better to end the relationship or both get pulled into the insanity together. Her repeating mantra at the end of the song is one of the album’s most striking bits of lyricism: “Stuck in the ocean/Drowning by the mouthful/Deep in the stone well/Calling up the black hole”. It’s just uncanny, how romantic this trio manages to make it all sound, even though you know that it’s deceptive and it’s actually the sound of a person being lured to their doom. A mellow acoustic song eases off on the heavy arrangements and also on the melancholy – it’s still there to some extent, but here Stacy’s words are more hopeful and devoted. This is a simple song of gratitude to someone who lights up her world, who dares to make her a better person. Her voice is fragile enough here that it sounds at times like she’s reaching for notes that don’t quite work – though I suppose this is nothing new if you’ve heard some of Eisley’s more experimental numbers such as “Sun Feet”. Also reminding me of an aspect of Eisley that I could take or leave is her over-reliance on a lot of “Oh-oh-oh”s in the bridge, and the way that the song wraps up just when you’re getting into it and the arrangement seems to be building to something. Still, the classical fingerpicking here is lovely and the vulnerability is appreciated, so consider this a breather between two of the album’s more emotionally involved songs. It’s funny how some of the most serenely beautiful moments in Sucré’s songs accompany the some of the biggest moments of lyrical turmoil, and then you get a song like this which sounds like a bizarre clash of ideas, and it turns out to be the most unabashedly romantic thing on the album. As watery piano and twitterpated strings fade in, you think you’re in for another lush ballad, which is sort of true, but Darren is a real spanner in the works in this one, click-clacking about with his syncopated rhythm and managing to transform the mood completely when the chorus hits. Just as Stacy’s lyrics turn from gentle thoughts of finding peace in a passing breeze or holding someone to make them feel safe (I don’t think I’ve ever heard the desire to dry someone’s tears expressed as beautifully as, “I’ll keep the water from rushing to your eyes”), the chorus brings the corrosive “chemical” element into the song, with much more of a trip-hop feel to its heavy drums and deep, warped bass notes, all while Stacy is shouting her lover’s name loud enough for the heavens above to hear. At first I was convinced this was an experiment which just plain didn’t work, but it only took a few listens to convince me that this was the most ingenious song on the record. It’s the one where the group opens up the most (it’s over five minutes, while most of the rest of the songs are less than four), unafraid to let the delicate “just-so-ness” of a Jeremy Larson arrangement collide with the mad scientist-like rhythmic work that you’d be more likely to expect when the members of MuteMath were in one of its trippier moods. It’s so obvious what each individual brings to the table here, and yet I can’t think of another composition that’s quite like it. Wow. Mood whiplash, anyone? Sucré never does anything particularly loud or heavy, but the mood of this one’s quite obviously angry from the way Stacy is repetitively banging on the piano (two chords for most of the song – it gets old fast, unfortunately), and there’s that horn section again, blaring at her as if they’re a bunch of cars passing her on a dark highway, determined to point out that she’s headed in the wrong direction. Someone she cares about is gone, and his absence has everyone talking to the point where her ears are burning, so it seems all she can do is tell the guy off in absentia. “You stole my heart, and in the dark/You said that you were right there/But you’re not/I can’t believe you again/And so I wake up, I have to pretend.” These pointed words could come to a head in an explosive chorus, but unfortunately Stacy wastes an intriguing arrangement by filling it with her heaviest load of “Oh-oh-oh”s yet. The drums can tumble about as turbulently as they want, the horns can bring a maelstrom of frustration, but without a solid chorus to bring it all together, the song becomes untethered, missing its chance to truly… well, say something. Lots of foot-stomping and hand-clapping in this one. It’s the most up-tempo thing on the album, putting “When We Were Young” in a distant second if you’re counting pure bpm’s, though it has its quieter moments as well. I tend to think of this one as mostly a Stacy and Darren collaboration, because the rhythm is so strong that it seems to crowd out the very need for a lush arrangement. (There are still strings and guitar and keyboards there, but I almost think this one could work with just voice and percussion if the group ever did a super stripped-down acoustic show. Assuming Stacy had some vocal backup, anyway.) She’s frantic because someone she loves has gotten away and she fears she’ll never see her again, which leads to the catchy chorus: “”You got away, you got away/You run away, you’re like a stampede in the dark.” It’s more of a mantra than an explanation of something that makes a whole lot of sense… most of the song repeats that as well as her admission that “I swear someday I’ll be sorry.” Conflicted, much? I wasn’t sure how to deal with this one for a while. It’s one of those songs that seems to quietly delight in subverting my expectations, both musically and lyrically. The blast of accordion that hits me right at the beginning makes it easy to picture myself in a French cafe, so I’m in the mood to expect something slow and romantic, but then Stacy starts lamenting: “Love has come to off me/Oh, there’s nothing left in this world/Fear is dominating/Oh, there’s nothing left in this world.” So I guess they’re back in high melancholy mode, romanticizing death in a manner of speaking, just like in “Troubled Waters”? Not quite. Darren does bring in some a syncopated percussion track that is strongly reminiscent of “Troubled Waters”, just with more stomping and less clapping, and it gives the song a delicious groove in between its detached flights of slightly morbid fancy. But then what’s she dying to? The song seems to turn a corner back into the light as I slowly realize that this actually is a love song. Perhaps it’s a sort of death to an old self, or a realization against her better judgment that she can never go back to being the sensible single girl, but either way, it’s a hopeless and permanent transition. There’s almost a wry sort of humor to the way she tells it, but it’s extremely subtle, and I’d imagine this will be highly subjective in terms of who finds it compelling and who finds it depressing. I’ll take it with a nice foamy cappuccino and my wife (with a cup of some flowery-smelling herbal tea, since she’s not a coffee drinker) while floating in a gondola, if you please. This is definitely the most abstract song on the album, since the strings are much less about “romantic flutter” than they are about “tensely wandering about in a disembodied dream state”. The melody keeps shifting in weird ways, never really stumbling across anything you’d recognize as a chorus, as if the whole song was discovering itself as it developed. In terms of pure ambiance, it’s a triumph, since you really get the feeling that Stacy’s trying to awaken from a restless dream, and there are these little moments where her voice seems to echo, as if falling from a precipice into a void of infinite depth. She reaches for a lot of weird high notes here, and this won’t be to everyone’s taste, but despite its lack of an obvious hook, I’m finding this one to be strangely compelling. It’s the moment where I’m reminded most strongly of Jeremy’s solo work – not so much the songs as the mood-setting interludes, which bridge the gap quite beautifully between songs even though their moods can shift quite dramatically within only a minute or two. Truth be told, this album could have used a few purely instrumental moments like that, particularly at the end of this song, which feels somewhat abrupt when it ends only three minutes in. I kind of feel like I wanted to hang on to that dream state longer, if only to understand more about what it means. Hey, that’s not fair! You can’t call a song a waltz when it’s in plain old 4/4 time! Ah, but that’s where this one gets a little tricky. Its sparse piano outro, with its isolated piano chords and its somber sustained horns, could have easily come from one of the lonelier moments on a Sigur Rós album. It’s slow and even enough to feel like common time, but when you get into the meat of the song (what little there is, anyway), the piano fills in the gaps with little triplets and you can see how the titular dance might work. It only lasts as long as Stacy’s two brief stanzas of lyrics, which I might as well quote in their entirety for all the sense I can make of ’em: “Fly to me and we can start again/Oh, I try harder to please you/I catch you staring after me/Is it that hard, Johnny?/I want to see you smash open wide.” It’s just a little fragment of a thing, occupying maybe one minute of a three minute song while the other two are just the slow intro and outro of piano and horns, half-majestic and half-tragic. Even if it’s as sparse and abstract as this, I find myself wishing for something I could sit with a little longer as the album ties up – it floats on by so fast that the gravity of it is never quite revealed. The name “Johnny” hints that my suspicions of a fictional story may have been right all along, but instead of shedding any light on this, the album sleeve just unfolds to two nondescript, black pages, devoid of any text. My mind longs to fill in the characters and details of the story, but the artist and/or label has provided nothing but a few breadcrumbs to satiate me. Oh, well. At least that somber coda leads beautifully back into the opening strains of “Hiding Out” if you let the album wrap back around to the beginning.